Need a reed you can rely on? The Legere Bb clarinet synthetic reed features an original cut that produces a dark and more focused sound. The 2.5 strength is perfect if you need a balance of a 2.25 and a 2.75. Perfect for projecting your rich tone, the Legere clarinet reed features a thicker tip making it ideal for marching bands and large ensembles. Whereas a traditional cane reed would need changing regularly due to damage and natural wear, this synthetic Legere reed will last much longer due to the composite materials used. This could save you a lot of money in the long run. 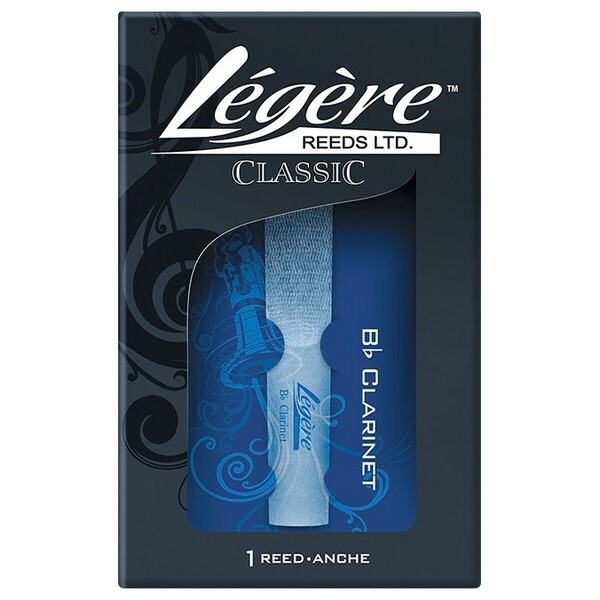 Made from some of the latest materials and using extremely advanced machine crafting, the Legere reeds are built so that every reed will be identical to the next. With some cane reeds, there are differences from one reed's strength to the next, but with Legere reeds, you can be sure that every reed will be absolutely consistent. "I must say that when I actually tried the reed I was more than pleasantly surprised! The consistency in the strengths is outstanding - I must say that I've been increasingly frustrated by traditional reed manufacturers' lack of consistency between the grades. With Legere you know exactly what you're getting straight out of the box." "The Legere reeds are the way of the future, now! They have phenomenal consistency, excellent response and reliability. Most importantly, they help create a beautiful, smooth tone in all registers. Using a fantastic reed, one can finally get on to making music, instead of just playing the clarinet." If you are unsure which strength reed is most suited to you, check out the PDF comparison chart above, which features comparisons between many of the top cane reed brands.